Delicate and stylish these classic white pearl earrings feature high quality 4mm round pearls mounted on 9 carat gold flowers. 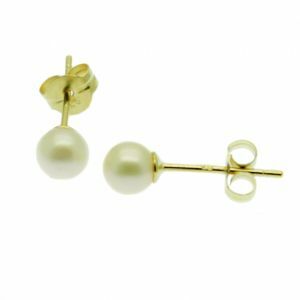 Delicate and petite these enchanting white pearl earrings feature high quality 4mm round cultured pearls mounted on a 9 ct gold flower. These beautiful, diminutive pearl stud earrings are perfect for anyone that prefers a smaller earring, and would be perfect for a young bridesmaid or flower girl. Your earrings will be delivered in a quality box with ribbon, suitable for gifting. Our classic white 9mm cultured pearl earrings feature very high quality round pearls mounted on 9 carat gold studs. 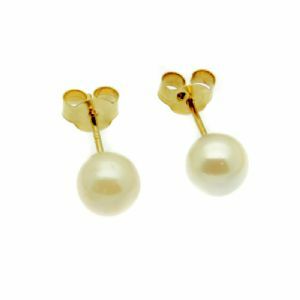 Our classic white 8mm cultured pearl earrings feature very high quality round pearls mounted on 9 carat gold studs. Our classic white cultured pearl earrings feature very high quality round pearls mounted on 9 carat gold posts. Our classic white cultured pearl earrings feature very high quality round pearls mounted on 9 carat gold studs. Our classic white pearl earrings feature very high quality round pearls mounted on 9 carat gold posts. Delicate and stylish these classic white pearl earrings feature very high quality 4mm round pearls mounted on 9 carat gold posts.